We’re back home from our trip to Tampere and decided to just chill out tonight. Tomorrow we’ll try to cram in as much last minute panicking as possible. Got these very strange things called Nutties from the shop. 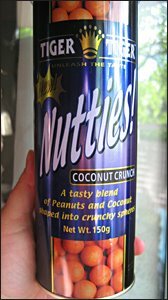 Apparently they’re ‘a tasty blend of peanuts and coconut shaped into a crunchy sphere’. Catchy eh. 😛 They have this sort of a coconutty shell which is hollow inside apart from a nut. What I don’t understand is, how they get the peanut in there?? They taste a bit weird as well… well, a lot weird. Anyways, I’ll write an entry about the Suzanne Vega concert a bit later/possibly tomorrow. Have a headache at the moment and just want to relax a bit.